Deciding to leave the home you love is not an easy decision to make. Especially if you love the neighborhood, the neighbors and the memories built within your home’s walls. While some decide it’s time to downsize and let others worry about lawns and snow-covered walkways, others choose to age in place. Aging in place means you can stay in your home comfortably and safely, now and in the future. This often requires the expertise of a home remodeler. The National Association of Homebuilders estimates that over 70 percent of homeowners doing a remodeling project are planning for the future needs of themselves or their parents. The trend is so strong the NAHB established the Certified Aging in Place (CAPS) designation, where select builders and remodelers become certified as an Aging in Place Specialist. A CAPS Specialist is trained in design principles, which make a home more livable for all ages and stages of life. Jeremy Hanson is president of Chicago-based Independent Living Solutions and is CAPS certified. He has completed numerous remodeling projects in and around the Chicagoland area to help people stay in their homes, or help families make a home more agefriendly for aging relatives. Hanson gave us an overview of the aging in place building trend. Q. Why is a CAPS certification important? A. The CAPS certification was developed by the NAHB, the AARP and others as a way to address the growing number of homeowners that were in need of aging in place home modifications. The program was designed to teach attendees communication strategies, design and building solutions for aging in place and business management. We were actually the first CAPS certification in the city of Chicago. I think it’s important because it gives homeowners a starting point when they are thinking about these types of projects. While the construction of doing an aging in place remodel is the same as doing your standard home remodel, the knowledge base we bring to the project is the difference. Q. What homes are suited for aging in place? A. There’s always a solution for any type of home, but a ranch style home is probably the best starting point. The fewer stairs and the fewer level changes the better. I think a home with a full bathroom and bedroom on the first floor is advantageous as well. Q. Why remodel instead of move? A. It’s their home. It’s where they feel comfortable. It’s where they raised their children. They don’t want to leave their community and neighbors. Q. What are your most requested remodels? A. The two most common remodeling jobs for us are bathroom modifications and helping someone get in and out of the home. On a daily basis the bathroom is a big priority for our customers and a lot of times a safety concern. We remove a lot of tubs and convert that area into a curbed or barrier free shower. 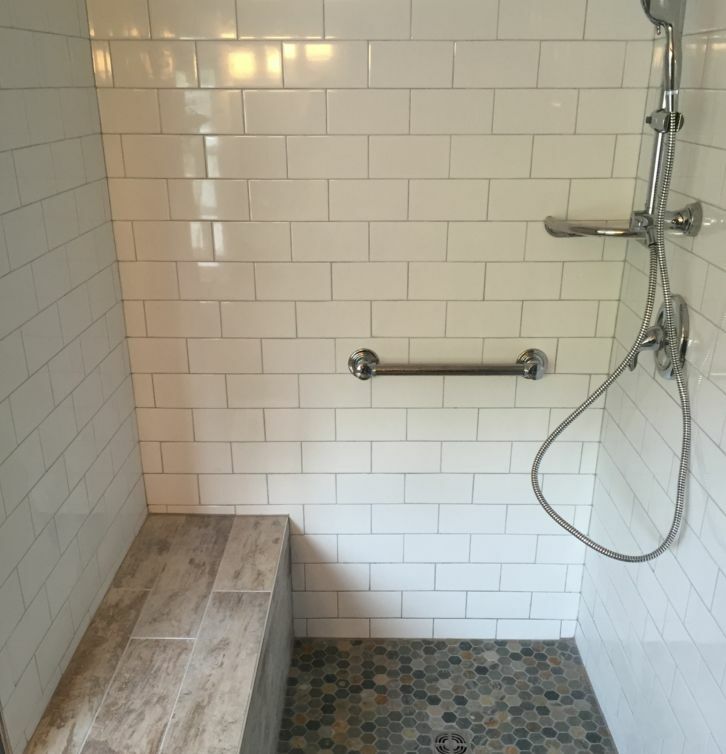 We can design and build a bathroom that is not only functional for people of all ages and abilities, but looks good as well. We perform all types of projects and sometimes it’s just a matter of some wellplaced grab bars. In and out of the home is a big priority as well. When we talk about aging-inplace the goal is not to just keep people in their homes, but to have them continue to be a part of their communities. That starts at the front door. The three options tend to be ramps, vertical platform lifts and stair lifts if someone finds themselves with mobility issues. Finding the right solution depends on the client’s needs and the configuration of the home. Q. What should you look for in a home remodeler? A. You should always start with a contractor who is licensed and insured. The CAPS certification through the NAHB is also a good starting point. Finding someone who specializes in this kind of work will help tremendously in the process. They will know the products and will have the solutions. What stops some people from considering a remodeling project is the mess and stress. The National Association of Home Builders offers the following tips to help you live with a remodeling project. Communicate: Determine who you and your remodeler should contact for daily decisions or an after-hours emergency. Designate a backup for each contact person to assure continuity in anyone’s absence. Speak up. If you are uncertain about any aspect of the project, be sure to let the contact person know. Pre-construction meeting: One way to ensure the success of your project is to plan for and actively participate in a pre-construction meeting. This allows your remodeler to clarify procedures and explain how the job will progress. Prepare for inconvenience: A remodeling project can turn your home and — on some days — your life upside down. For example, a kitchen remodel will affect meal planning. But a little ingenuity and some culinary shortcuts can lessen the impact. Set up temporary cooking quarters by moving the refrigerator, toaster oven, and microwave to another room. Arrange a dishwashing station in your laundry room. If the weather is warm, fire up the grill and dine alfresco. Designate a safe haven: Find at least one place in your home where you can escape from the chaos and commotion. Guard against dust: During a remodeling project, dust has the tendency to appear everywhere from lampshades to plates stacked inside your kitchen cabinets. Work with your contractor to try keep out as much dust as possible. Maintain a sense of humor: Remember that certain things are out of your control and it’s best to laugh rather than upset yourself about things like the weather or delayed delivery of materials.